Your nose won’t tell you that you’ve arrived at Orphin. All that’s wafting around the Guerlain factory is the smell of sun-heated fields and woodlands. The plant is in a bird sanctuary, and no alien whiff must disturb the fauna, explains Elisabeth Sirot, Guerlain’s international PR and press director, as we surrender our handbags and slip on disposable lab coats. Today, the press is offered a rare glimpse into Orphin, where all Guerlain fragrances are manufactured from blending to packaging: the 10,000 m2 plant will be open to the public, as part of LVMH’s “Journées Particulières” operation, an open-doors weekend in several of the group's facilities and private rooms. The opportunity has attracted quite a crowd, with visits every 20 minutes. Ms Sirot ushers us through a corridor decorated with pictures of Thierry Wasser’s sourcing trips around the world. Finding, purchasing and controlling the quality of raw materials is part of the responsibilities of Guerlain’s in-house perfumer since 2008. He comes at least one day a week to Orphin to evaluate materials, blends in their various stages and final product batches. It is he who greets us after we’ve crossed one of the three temperature-controlled stockrooms (materials must be stored at different temperatures). “I come to help Paulo at the plant”, he says, referring to Paulo Dinis, who is in charge of manufacturing Guerlain fragrances. Some 750 formulas are still made here, including the fragrances for cosmetics (which are manufactured in another plant in Chartres), from 120 grams of oil for custom blends for private clients up to one ton vats of La Petite Robe Noire. 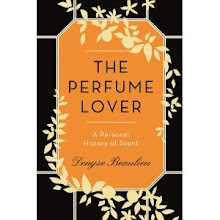 Wasser gives an example of his work on materials by explaining that while Jean-Paul Guerlain favors oil from riper bergamot, he himself prefers oil from earlier crops, so that different qualities go into their respective formulas. Wasser also insists on the fact that Shalimar is actually very much a floral perfume that includes the famous “rose de Mai” from Grasse in its formula, alluding to the war carried out between Guerlain and a certain unnamed company in Neuilly to nab batches of the rare material. Knowing that he is speaking in front of fragrance bloggers, he can’t resist a few snarky comments on IFRA and EU restrictions, stating that he is one of the few actively speaking out against their policies. We are shown the maturation room, where the oils are aged before being ushered in the Cathedral, with its 163 vats (from 300 to 4000 liters) where solutions macerate before being bottled. Then we are talked through an exhibition of historic bottles – 850 different models have been designed since 1828 – before getting a glimpse into the label-making process. 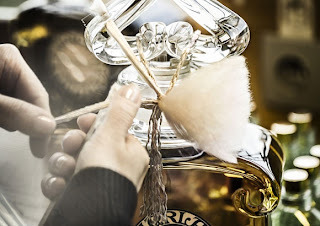 In another vast, well-lit room, the “dames de table” (“ladies of the table”) demonstrate the final steps of packaging bottles of extrait, the baudruchage and winding a golden string around the neck of the bottle. We are finally shown the automated packaging process: La Petite Robe Noire bottles zipping through assorted machinery popping on their stoppers, stamping on their labels, slipping them into boxes and wrapping the boxes in cellophane…The scene is half Jacques Tati, half Chaplin's Modern Times. Throughout the visit, we barely catch a whiff of scent: when I think I detect Mitsouko, I realize it comes from my top… We tumble out into the parking lot to make room for more groups, still a little dazed from everything there was to take in – and perhaps a bit frustrated that we haven’t smelled a single thing. The sight of Jacques Guerlain’s perfumer’s organ, all its phials unopened since he passed away, being perhaps the most maddeningly tantalizing sight... If we haven't poked our noses into them, it's because we're very, very nice. Since no cameras were allowed inside, here is the link to a filmby Le Parisien with Daily Motion. The above picture was sourced on the website of the Journées Particulières. Wow, Denyse. What a visit! I wish I could have gone. Like a dream sequence but a real field trip. Thank you for writing this up and sharing this. Next you'll be off to Versailles. Jarvis, it felt as though I was reconnoitering for a later, more leisurely exploration -- so many questions to ask Paulo, for instance! Jordan, as a matter of fact, I *will* be going to Versailles later this year for a book signing! Fascinating! Very different from your trip to the site where Seville a l'Aube was mixed. Those huge bottles and that organ - I almost wouldn't even want to go there and be tantalized to such an extreme! Nozknoz, it was very different indeed, though Paulo Dinis and Olivier Maure (the owner of Art & Parfum) are, to me, very much birds of a feather. Fantastic guys, so knowledgeable and passionate about their work! And, yes, Thierry is a very dapper gentleman indeed. And he just wears the best suits too! I am so shallow. I need to know what shade of beige that the manicured hands in your picture is-what a perfect manicure. And what a field trip for you! But how maddening there was nothing to smell. The Mitsouko sounds like the perfect scent for the trip. I was given a bottle of My Insolence, complete with body lotion. I can smell its relationship to Shalimar but there is something in there that doesn't sit quite well with me. Maybe the fruit makes it feel too young for me. i also was given a bottle of prada number 3-Cuir Ambre. It's wopnderful and complex-full of oakmoss. It has staying power for days, too. 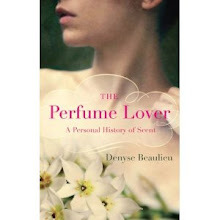 Do you know this fragranc, and do you like it? Carole, that manicure is a wonder to behold indeed! I do know Cuir Ambré, I remember almost buying it when it came out, but on me it went through a brief phase with a very unpleasant effect which made me decide against it. I should try it again. Qui a gagné le flacon de Séville à l'aube?